FIVE HORNBY DUBLO 3-RAIL HALF CURVED TRACKS 1 STRAIGHT In solid condition with all connectors and fishplates. Dispatched with Royal Mail 2nd Class. 3 off EDBS  Straight short rail 1 5/16" long. 3 off EDA1 1/4  Curved quarter rail 15" Radius. 4 off EDBS  Straight short rail 1 5/16" long. 2 off EDA1 1/4  Curved quarter rail 15" Radius. 2 D1 switches in working order with thumb nuts & boxed. Small tabs. Approx weight is 1170 grams. Plenty of pictures for overall condition. Hope they can be of use. Ask for Quote. I am always happy to help if a problem occurs. Keep looking i may have what you want. 4 D1 switches boxed in working order including thumb nuts & boxed. 1 off EODPR  Right Hand 5 3/4" long. 1 off EODPL  Left Hand 5 3/4" long. PAIR OF ELECTRICALLY OPERATED POINTS. SIX HORNBY DUBLO 3-RAIL FULL STRAIGHT TRACKS. In solid condition with all connectors and fishplates. Dispatched with Royal Mail 2nd Class. 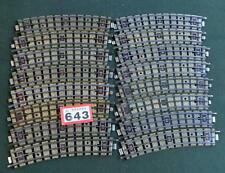 SIX HORNBY DUBLO 3-RAIL FULL CURVED TRACKS. In solid condition with all connectors and fishplates. Dispatched with Royal Mail 2nd Class. FIVE HORNBY DUBLO 3-RAIL HALF STRAIGHT TRACKS In solid condition with all connectors and fishplates. Dispatched with Royal Mail 2nd Class. FIVE HORNBY DUBLO 3 RAIL HALF STRAIGHTS 1 UNCOUPLING TRACK. In solid condition with all connectors and fishplates. Dispatched with Royal Mail 2nd Class. SIX HORNBY DUBLO 3-RAIL STRAIGHT TRACKS. *LARGE RADIUS* In solid condition with all connectors and fishplates. Dispatched with Royal Mail 2nd Class. 1 X Diamond crossing. 1 X manual uncoupler half straight. 2 X Short straights boxed. 8 X full curves (15" radius). 8 X Full curves boxed (15" radius). 2 X Right Point. FIVE HORNBY DUBLO 3-RAIL HALF STRAIGHT LEVEL CROSSING TRACKS In solid condition with all connectors and fishplates. Dispatched with Royal Mail 2nd Class. 6 sections EDB1 Straight Section. These have the wider type connecting tabs. New listingMarklin OO HO K Track pair of curved points / turnouts. Used. I have tested with 15v.a.c and they crisply move. I may well have it for sale. Copies of recent correspondence to which I have not had a reply. Blackened mild steel. 80 thou (.080") 2.0mm thick clear plastic card. PICK UP OPTION. Deluxe Materials AD25 Scatter-Grip Tacky Glue. Expo 73545 No.234 Razor Saw Blade (fits X-acto). You might also like. 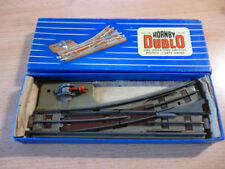 Hornby Dublo 3-rail tracks x 23. Shiny Rails. Train. See 5 pictures & list. VGC. The rails are free of baseboard-paint contamination and the permanent way colour is well matched. The electric uncoupling rails have been tested and are working. Half-length straight rails x 7. Manual Uncoupling rail x 1. Compatible with products by Hornby, Bachmann, Mainline, Peco, Gaugemaster, and Lima. SIX HORNBY DUBLO 3-RAIL QUARTER TRACKS In solid condition with all connectors and fishplates. Dispatched with Royal Mail 2nd Class. New listingHornby Dublo. 12 Full Straight Sections(1 terminal)& Level Crossing. 3-rail. Hornby Dublo. Small tabs. Approx weight is 1090 grams. Plenty of pictures for overall condition. Hope they can be of use. I am always happy to help if a problem occurs. Keep looking i may have what you want. 6 double straights in very good condition. Rest of World Australia,USA, etc.£14.50. 2x VINTAGE HORNBY DUBLO 3450 BUFFER STOPS (D1) FOR 3 RAIL TRACK, UNUSED, BOXED. THE LATE ISSUE BLUE & WHITE STRIPED BOX WITH CATALOGUE No.3450 IS IN EXCELLENT CONDITION WITH NO SCUFFING OR SIGNS OF EVER BEING OPENED. 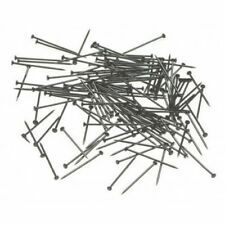 HAS RUSTY STAPLES AND PEN PRICE MARKS ON END. IT IS COMPLETE WITH CARD DIVIDER. The main picture shows the layout as we tested it. Points are of the earlier 3-rail type which do not isolate the siding when switched to the main loop. It is all in working order and tested with a locomotive. 3 off UBR  Manual Uncoupling Rail 5¾" Long. EDA 1 1/2  Curved Half Rail - 15" radius. These have the wider type connecting tabs. EDA 1 1/2  Curved Half Rail - 15" radius. 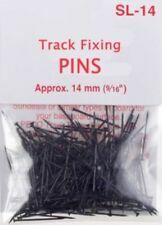 These have the narrower type connecting tabs. I am a model railway enthusiast, particularly Hornby Dublo. Lots 1 and Lots 2 photos are attached - 40 curves being available in total. HORNBY DUBLO -OO/HO Gauge, Ref.32241 - RAILER. Item: Railer. Condition: The railer is complete, clean - slight wear consistent with age and from light use/storage. MPN: 32241. EDB 1 1/2  Straight Half Rail - 5 3/4" long. These have the wider type connecting tabs. Wonderful old graphics on the box would make a great display on its own. EDA2  Outer Curve Section. 17 1/4" Radius. - 8 form a circle. Hornby Dublo EDG17 Tank Goods Set B.R. EDG17 Tank Goods Set (B.R.). Hornby Dublo. 3 Rail (Original/Boxed). for 3 rail layouts. with slight stain to front lid. (can pull wagons from the front). front bottom side piece detached from sides. VINTAGE HORNBY DUBLO EODPL POINTS LH ELECTRIC 3 RAIL . 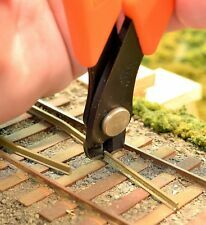 VINTAGE HORNBY DUBLO EUBR UNCOUPLING RAILS ELECTRIC 3RAIL . HORNBY DUBLO DIE-CAST METAL LEVEL CROSSING WITH ROAD TRACK SECTION IN BOX.V.G.C.